Eighteen of William Byrd's most perfect motets illuminate a journey through the Church's year in the company of perhaps the world's most famous choir. From the beginning of his professional career as Organist and Master of the Choristers at Lincoln Cathedral in the 1560s, Byrd wrote Latin sacred music. This is not in itself particularly remarkable, despite the fact that such pieces were banned from being used in church. Most of the music that Byrd composed during his Lincoln years was not connected to his official role at all, but was devised as chamber music for performance elsewhere, much of it in clandestine Catholic households. While in the public eye Byrd appeared as the dutiful servant of the Anglican establishment at Lincoln, fulfilling requests from his employers for service music and anthems for the new English liturgy, at the same time he explored a wide range of contemporary musical styles and forms, including his earliest works for viol consort and keyboard. What is more remarkable is that in the course of a half century which witnessed turbulent religious unrest, the national emergencies caused by the conflict with Spain, and the uneasy transition from the Elizabethan age to the troubled reign of James I, Byrd not only continued his activities as a dissident Catholic composer working in a staunchly Protestant environment, but also published five collections of Latin sacred music. In the course of a long productive life which spanned the reigns of three monarchs, Byrd composed music for every significant day in the Catholic liturgical calendar, in what would seem to be a series of coherent publication initiatives. The selection of motets on this recording is presented in the order in which they appear in the pre-Reformation church year, beginning with Advent. The sequence ends with a Marian motet, the Virgin Mary being a joint patron of King's College Chapel. The first of these publications, the Cantiones quæ ab argumento sacræ vocantur, ‘songs which on account of their subject matter are called sacred’, was printed in 1575. This was just three years after Byrd had been sworn in as Gentleman of the Chapel Royal in a ceremony which involved him making a declaration that the Queen ‘is and ought to be, by the word of God, the only supreme governor of this realm … as well as in all spiritual or ecclesiastical things or causes, as temporal’, together with a rejection of ‘all foreign jurisdictions, powers, superiorities, and authorities’. Coming just a few years after Elizabeth had been famously excommunicated by the austere Dominican Pope Pius V, ever-vigilant in his crusade against all forms of heresy, Byrd’s continuing commitment to his Catholic faith was not only contrary to his oath; it also made him liable to excommunication. For the rest of his life, dual allegiance to both his sovereign and his Catholic faith co-existed uneasily. The Cantiones was produced under the terms of a royal patent which gave ‘full privilege and license unto our well-beloved servants Thomas Tallis and William Byrd’ for the printing and distribution of music in England for a period of twenty-one years. In symbolic terms, the joint publication must have been seen as a clear signal that the country’s most distinguished musician, who had been in court service during the time of Henry VIII (Tallis was described in the late 1570s as ‘verie aged’), was now publicly anointing his successor in print. The Cantiones contains seventeen pieces by each composer, with Tallis as the senior of the two providing both the opening motet, and the concluding virtuosic demonstration of canonic skill, the seven-part Miserere nostri Domine. Byrd’s O lux beata Trinitas demonstrates the younger composer’s command of such techniques in its final verse, which presents a strict canon in which a single line opens up into three voices entering at different pitches, a clear aural representation of the Trinity. This contrasts with the previous verses, which are written in the fashionable Italian note nere manner, which Byrd might have picked up from any number of contemporary madrigals by Marenzio and others then circulating in England, but the co-existence of these two different compositional styles is not entirely convincing. The choice of seventeen pieces each may not have been casual; the Cantiones appeared in the seventeenth anniversary of Elizabeth’s reign, while her Accession Day on 17th November had been increasingly promoted over the years as a great national festival. Although Tallis and Byrd address the Queen in the first person in the dedication, noting in the expected flattering terms Elizabeth’s musical abilities, there is no evidence that their music was performed in the Chapel Royal, notwithstanding her taste for all the trappings of ceremonial forms. Very little polyphony had been printed in England prior to the Cantiones, and most music in circulation was imported from the major printing centres of Venice and Antwerp, something acknowledged in the Tallis/Byrd patent which forbade others from selling ‘songs made and printed in any foreign country’. Yet despite the protection afforded by the royal patent, and the elegance of Thomas East’s presswork, the book was not a commercial success; fourteen years were to elapse before Byrd and his publisher felt inclined to test again the market for Latin sacred music. Their next entry into the market, Byrd’s Liber primus sacrarum cantionum, ‘the first book of sacred songs’, was published in 1589, to be followed two years later by a second book. Taken together these two volumes, which represent more than ten years of compositional activity, are a monument to Byrd’s musical and personal concerns during the middle years of his life. The second book is dedicated to John Lumley, an aristocrat of taste and discernment, who had assembled a collection of paintings, works of art, and a sizeable library including music. 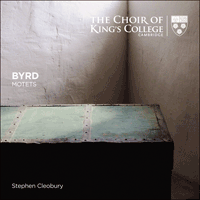 Byrd had a private lodging in Lumley’s London townhouse, where he could have consulted his patron’s copies of motet books by Palestrina and Lassus among others, but the motets of his own two books of Cantiones are quite unlike anything he might have encountered there. Most of their texts are dark, anguished cries of distress which speak of penitence and suffering, the destruction of Jerusalem, and the desire of the children of Israel for liberation from ‘the yoke of our captivity’, clear references to the oppressive conditions which English Catholics were forced to endure. Although Byrd and members of his family were often summoned before the Middlesex Session and the King’s Bench during these years, when they lived in Harlington in Essex, none of them were imprisoned, and it is doubtful that they were even required to pay the fines that were levied for recusancy. Nonetheless, the constant harassment, the house searches, and the distraints levelled against Byrd all took their toll, and must be weighed in the balance when considering the tone of these pieces. Ne irascaris for example, a text taken from Isaiah, typical of many of them in its musical resources, concludes with an almost unbearably long drawn-out setting of the words ‘Jerusalem is desolate’. Yet not all of the texts spell gloom and despondency. Laudibus in sanctis, a paraphrase of Psalm 150, moves through the usual catalogue of instruments, including trumpets, drums, and cymbals, with festive wit. It was almost fifteen years before Byrd embarked upon his last major compilation of Latin sacred music, the two books of Gradualia published in 1605 and 1607. Written in a relatively short span of time, they are fairly unified in style, and constitute his final and crowning achievement as well as being the most powerful testament to Byrd’s Catholic faith. In the intervening years, his three settings of the Ordinary of the Mass, for three, four, and five voices respectively, had been printed as short pamphlets, without title-pages, dedications, or dates. Both the format and the style of presentation adopted by East (whose involvement was not advertised on the page though Byrd’s was), proclaim their expected use in recusant communities. Whereas the Masses could be sung in everyday worship, the Gradualia contain 109 Propers of the Mass, texts which changed on a daily basis. For their presentation in print, Byrd devised an ingenious system in which discrete sections of text could be transferred to another liturgical context if the text itself recurred. Despite their obvious function as sophisticated additions to worship in the houses of the rural Catholic aristocracy, and their thinly disguised connections to the English Jesuits and their mission to re-convert the country, permission to print the two collections was granted by Richard Bancroft, Archbishop of London and later Archbishop of Canterbury. Both books carried dedications to known sympathisers of the Catholic cause, the second to Sir John Petre whose principal residence, Ingatestone Hall in Essex, lies close to the village of Stondon Massey where Byrd and his family had moved in the 1590s. The gap between the appearance of the two volumes may well have been caused by the wave of anti-Catholic feeling that followed the discovery of the Gunpowder Plot in November 1605 and the enactment of the Popish Recusants Act of the following year; Byrd’s preface to the second book complains that the contents had been ‘long since completed and delivered to the press’. Perhaps best known of all is Ave verum corpus, written for the feast of Corpus Christi which, as one of the high points of the liturgical calendar in Catholic Europe, continued to be celebrated in private by English recusants. Composed in the affective homophonic style that Byrd used in some of his most imposing doctrinal statements and politically-charged motets, it opens with a particularly telling use of cross-relations, which emphasises the word ‘verum’, and underscores the concept of transubstantiation, one of the most bitterly contested theological arguments of the Protestant Reformation. 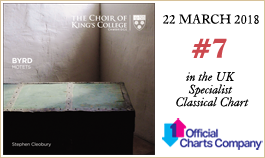 For more than half a millennium, King’s College Chapel has been the home to one of the world’s most loved and renowned choirs. Since its foundation in 1441 by the 19-year-old King Henry VI, choral services in the Chapel, sung by this choir, have been a fundamental part of life in the College. Through the centuries, people from across Cambridge, the UK and, more recently, the world have listened to the Choir at these services. Today even people who aren’t able to attend services in the Chapel have heard King’s Choir, thanks to its many recordings and broadcasts, and the tours that have taken it to leading international concert venues around the world. Despite its deep roots in musical history, the Choir has always been at the forefront of technological innovation, and records exclusively on its 'impeccable' own label.